Reinforced Rubber Belts are designed for heavier duty and hard wearing applications, often but not always positioned outdoors, these belts are available in a range of strengths and thicknesses from 2ply fabric back belts carrying light weight boxes to heavy duty 5ply with 6mm thick top cover belts carrying heavy stone. Secondhand belting can be supplied subject to availabilty. In a busy plant environment downtime can be very costly. We can arrange and organise Emergency or planned Maintenance on-site fitting of all belts either with Vulcanised joints or Flexco Fasteners. Thicknesses range from 5mm to 20mm. Hot moulded cleats available onto any rubber belt, including fabric back and oil resistant. Cleats can be moulded at various pitches and onto belts up to 3000mm wide. 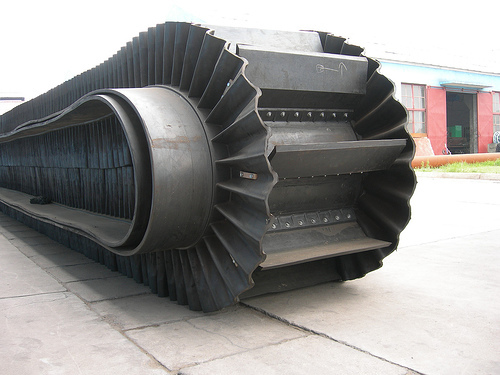 Conveyor Belts with corrugated and anti-spill edges are all designed and fabricated for specific applications. The Sidewalls are produced from a high elasticity and high strength rubber compound and offer excellent flexibility and therefore maximum flexing. The use of diagonal fabric for the reinforcement within the Sidewalls ensures maximum elongation of the fabric at the flexing points increasing the life of the Sidewall. A, B, C Section moulded rubber tracking guides available. Made with E.P. fabric plies. 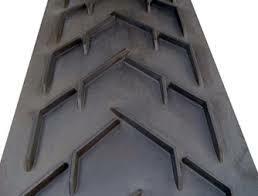 The top and bottom are provided with abrasion resistant rubber covers to DIN 22102 and BS 409. All belts are suitable for jointing by vulcanising or by Flexco belt fasteners.